I'm starting to get out some of my cooler weather pieces like this leather jacket, and finally bothered to iron this rust colored top. I'm loving it with the purple pencil skirt. I haven't paired these two colors in ages, but they make for a lovely autumnal mix. I have some pretty new jewels courtesy of AMY O. Jewelry, who has also generously sponsored a giveaway for one of you to win this gorgeous Curb chain and Rhinestone bracelet as well! AMY O. is an acronym for Accessories Make Your Outfit - and I could not agree more; I am such an accessory addict and I don't believe I am fully dressed without them. P.S. AMY O. is offering a 25% discount for Chic on the Cheap readers - just use code chiconthecheap25 at the checkout! I love your skirt colour! And of course I can't imagine autumn without leather jacket. That is a really great fall colour pairing that would never have occurred to me - but it looks great and the touch of leopard in your shoes is just perfect. those colors look great together! true, accessories do make the outfit! WOW the bracelet is so pretty! And you look great! Lyddie, that top is gorgeous! Love the color and ruffles. Looks great with that skirt. Beautiful bracelet and what a wonderful giveaway. These colors are beautiful together!! I'm going to have to try this combo myself. 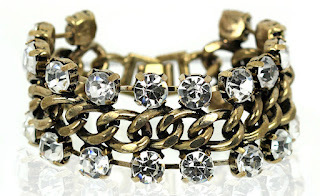 And that bracelet is gorgeous! i love those leopard shoes!! nice giveaway too!! you have a nice blog! 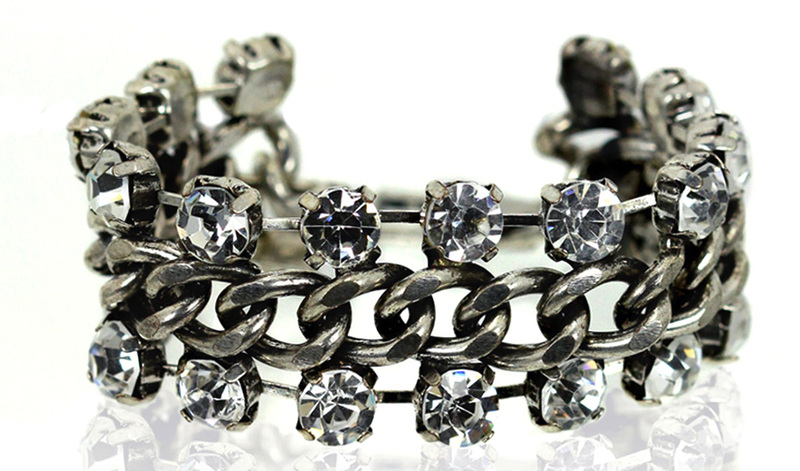 Oh la la, a sparkly bracelet is always a nice way to make something extra fun! I love that top with your skirt, it's very autumny indeed. the rust and plum color combo looks fabulous on you!! I love those shoes with that color combination. You look lovely. I love unexpected color combinations! this is one amazing one. Really beautiful colors...the jewel tones of that skirt and top are magic for Fall! Then, when you throw on the jacket and leopard shoes, you add that perfect subtle edge! Well done. These colors are so perfect together. They hardly look like chilly weather clothes and it looks so warm in your photos. Totally jealous! I love the rich fall colors you are wearing here. I agree, accessories can definitely elevate an outfit. The colors are great and what's not to love about a pencil skirt. The leather jacket is causing some envy here!!! I just entered for the giveaway.Thank you so much. I can't wait for that 80 degree day coming up, but this outfit is an absolutely wonderful fall one. If I had a top this color I would try to recreate it. I think the closest I have is beige. love the burgundy and mustard color combo. cute bracelets! love this look! the bracelet especially! You look wonderful, I am already big fan of you! Cute ruffles on your top. Great rust and egg plant color combo. Beautiful ruffles on your top! I love the colors, as well as the bracelet!! Love this color combo golden yellow and burgundy. I'm going to try this. The ruffles on the blouse are lovely! Love the mustard yellow! A fav fall color of mind for sure.